Last year, we dug into the data for two co-located high schools in East Oakland to see who those schools, located on the same campus, were serving, and the results were startling. The two school populations were not even close to similar, despite, in theory, drawing from the same pool of students. If charter schools accept public money, shouldn’t they be serving all kids? We are once again in Prop 39 season, when OUSD offers up “underutilized” classrooms at district schools to charters for co-location on the OUSD campus. This year, 9 schools have been given final offers of space, and although not all are likely to take the offers, some will and that will mean disruption to the OUSD students on those campuses. 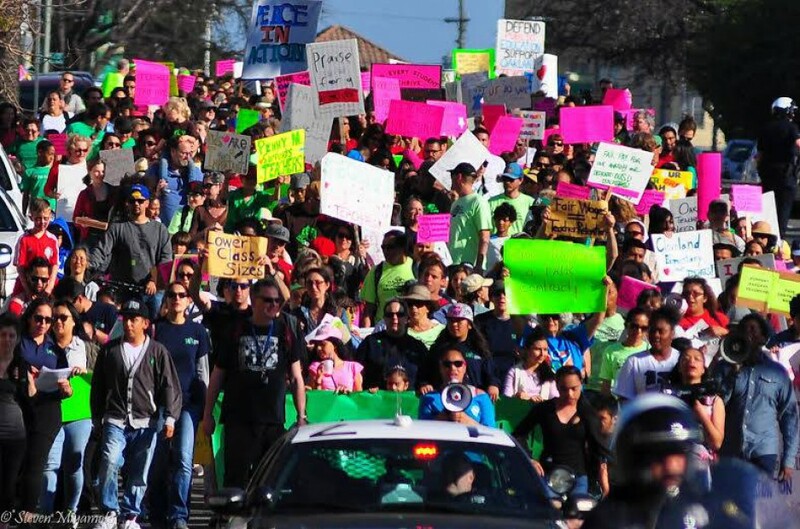 In one Los Angeles community, the potential co-location of the Ganas charter has resulted in a heated battle as district parents fight to stop the disruption and inequities caused when a charter school crowds onto their campus. In Oakland, the communities of impacted schools like Hoover, Bret Harte and West Oakland Middle School are organizing to show charter schools that the “underutilized space” that the charter would be co-opting houses vital services, and that the disruption caused by co-location is not welcome. Just as when we compared the two co-located schools in East Oakland, the results are clear, and extremely concerning. Charter schools in Oakland, at least those in District facilities, are excluding certain students in ways that concentrate need in the co-located or soon-to-be co-located district schools. At the most extreme, the population differences can be jaw-dropping. Bret Harte serves 17% more special education students than American Indian, with 11 special education teachers, a broad spectrum of need including some who require constant medical care, not to mention the 265 newcomer students in two programs. The “underutilized space” at Bret Harte provides places to meet the needs of those students and more. Equally problematic is the “othering” of students that often accompanies co-locations, and that is particularly true when the difference is economic. At Frick Impact Academy, 93% of students qualify for Free or Reduced Price Lunch. The potentially co-located charter Urban Montessori has just 28% of students in that group, a jaw dropping 65% discrepancy. The socio-economic differences, especially at the middle school age level, can cause social and emotional harm to public school students who might see themselves as less than the more affluent charter school students. Charter schools like to refer to themselves as “Public Charter Schools” because they want us to believe that they are a public good in the same way our district schools are. The truth is, they are not serving all kids, and although they take public money, they are not public schools. District schools are serving all kids, regardless of need, and the spaces that are being offered up as “underutilized” are in fact critical for educating kids in those district schools. We hope that the charter schools which have been offered space at our schools, charter schools which we know are NOT including all children, will not compound the inequities that creates by taking away learning spaces from district kids. The Lakeview campus also has a charter, but it shares space with administrative offices and is not included here. Some charters were made multi-site offers and all of those schools were included. Some were offered space at campuses which no longer house OUSD students, and they were not included as the focus of this post is co-located schools. This study was limited to the two largest demographic groups in OUSD, African American and Latino. To be clear, OUSD is not doing enough for the students they serve, and we will continue to push the District to do better for all kids.